According to reviewer Weighty Man on HGW, this stall is indeed related to the famous one at Albert St. The Albert St. stall owners moved to Lavender Sq, and this one at Old Airport Road is opened by their relatives. There were two young strapping men manning the stall when I was there. And while you have to wait a while for the food, they deliver it to your table, so you don’t need to stand around. They are very polite. 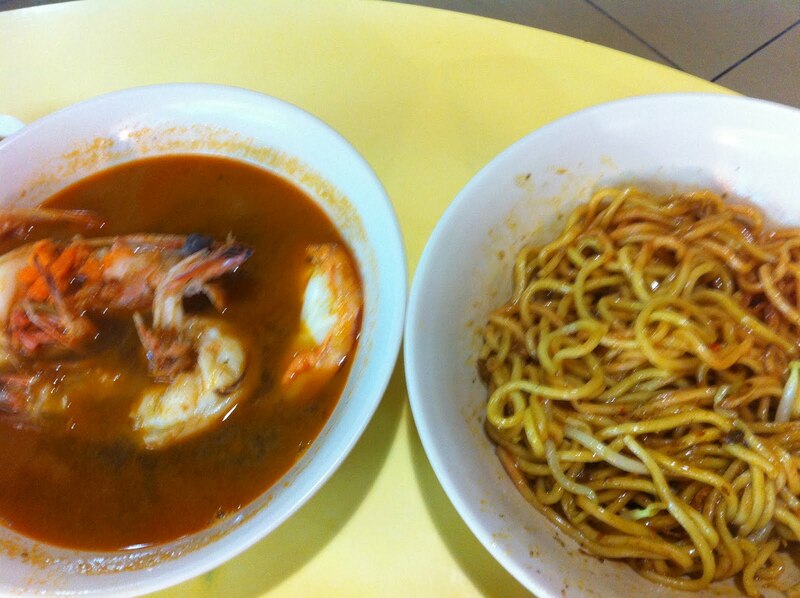 The noodles are very interesting because it is mixed with curry powder and wu xiang fen (five spices powder). I like how the young men are experimental but I didn’t quite get the taste, thought it was rather bland. But OMG OMG OMG. THE SOUP. Look at the intense crimson-ness of it. It was soooo full of the sweetness of prawns. And each mouthful tasted better than the last. Swirl it round in your tongue and the taste changes. I have never tasted prawn soup like this before. It’s like eating rainbows. I really admire young, honest hardworking men, working from morning 8.30am to 11.30pm at night. I wish this stall the greatest success.